Your customers are already reading reviews online to help them choose the services of a local business. They are also spending more time on Facebook, Twitter, Instagram or Youtube and sharing their views publicly. With our online reputation and social media services, we make it easy for your business to collect customer testimonials and reviews. 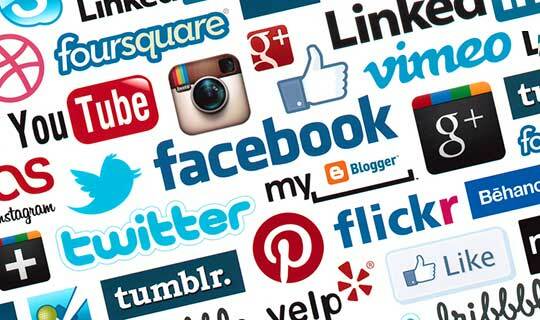 We also enhance your online visibility by posting content and engaging with your audience on relevant social networks. A research study on consumers who conduct local business searches shows that 69% are more likely to use a local business if it has information available on a social media site. 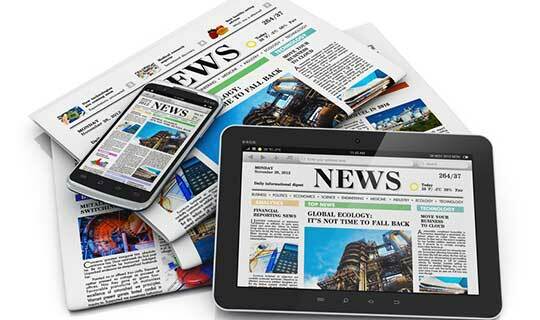 Another study shows that 78% of small businesses attract new customers through social media. No doubt, in recent years, social media has emerged as a great way for businesses to attract and interact with prospects and customers. With our social media marketing service, we work with you in creating a customized program to target new customers, build local brand awareness and increase your loyal following. We set up your business pages and optimize your profiles on Facebook, Instagram, Twitter, and other social networks and directories applicable to your business (e.g. Pinterest, Houzz). We also help you connect with your existing customers and provide you with tips and training on how to use each network. Social media is not just about promoting your business. In addition to cross-posting your photos, articles, testimonials and promotional offers to all your social media accounts and business listings, we will also work with you to find and post fun and interesting content related to your industry. The ability to connect and engage with your target audience is what makes social media a powerful tool for businesses. 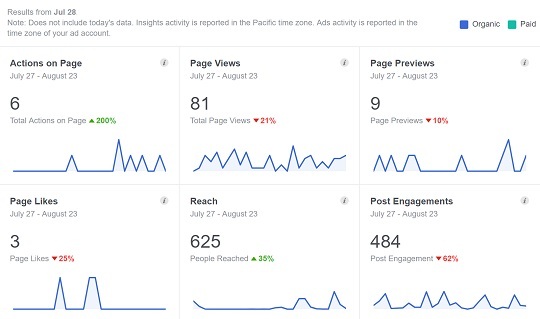 Based on your campaign objectives, we will build your followers, connect with your target audience, identify influencers in your community and industry, and track your engagement reports. Instamonial™ is a service that makes it easy for business owners to showcase your work on your website and social media. 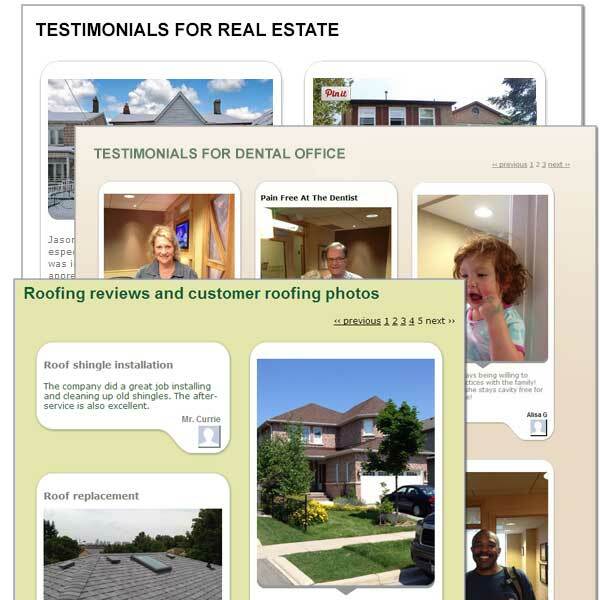 With the Instamonial app, you simply take a picture of your work or customer, and enter your customer's email address. 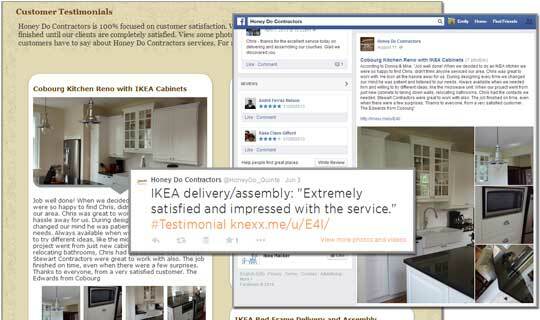 The Instamonial service automates the review request process and posts your photo-based reviews online. Quinte Marketing is an Instamonial™ certified partner. We customize every step of the review request process for your local business and provide add-on services for Instamonial™, including the ability to access their service without the iOS app. In a survey of local consumers, 88% of respondents claimed to regularly or occasionally read online reviews to determine the quality of a local business. Given the growing importance of online reviews in the purchasing decision, you want your customers to find positive reviews about your business in all the relevant social networks and review sites. We help you collect feedback from all your customers by setting up a weekly or monthly process where we email everyone you've done business with to fill out a short survey and find out how happy they are with your service. 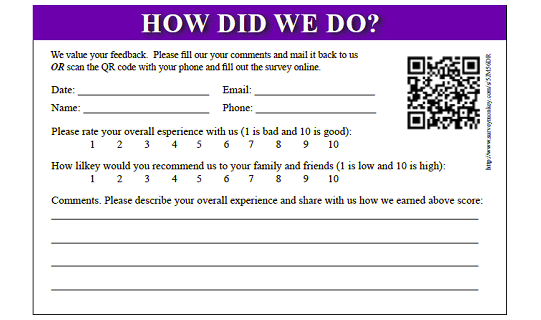 If you don't have email addresses, we will also print out comment cards for you to hand out to your customers and get their feedback. We will post any positive feedback you get from your customers to your website's testimonial page, as well as to your Facebook business page, Twitter and other social media accounts. In addition, we will also invite your satisfied customers to share their review with their Facebook friends and on Google+ and other niche review sites relevant to your business. Reward your happy customers and encourage word-of-mouth referrals by creating special offers and exclusive promotions which can be shared with their friends online. 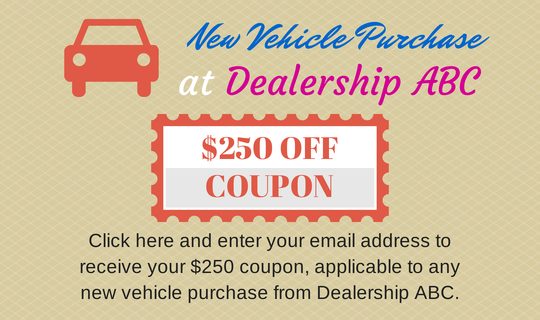 We work with you to create the most effective promotion (e.g. contests, giveaways or special deals) that best meets your business goals (e.g. grow your email list, bring in repeat business, get new leads).